While the market research industry has been increasingly relying on research via online surveys, making these surveys compatible with smartphones and other portable, Internet-enabled devices has proven to be a challenge. Although more and more respondents opt to complete surveys on these devices, respondents using these devices are also more likely to drop out of surveys before completion. This can be attributed to a variety of factors, including limits in cell phone coverage; limited data plans; respondents more likely to be in a situation where they might become distracted or have limited time; and questionnaires being too cumbersome to complete on a smartphone, or not being designed for completion via handheld device. 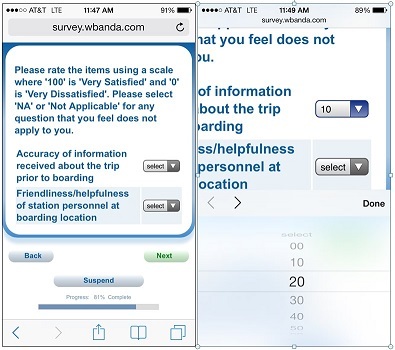 Surveys have traditionally been programmed to include multi-point scales in a grid format, a design that is not ideal for smartphones as screens are not large enough to display the full grid as it’s designed. Our new white paper, “Best Practices in Mobile Survey Design: The Impact of Mobile Phones” details the industry-wide issues relating to drop-offs among smartphone users, provides best practices in mobile survey design, and offers actionable solutions for researchers utilizing traditional grid surveys to minimize drop-outs. The white paper will help you understand who is dropping out (and when), so you can make traditional grid surveys more user-friendly for those completing on a smartphone.